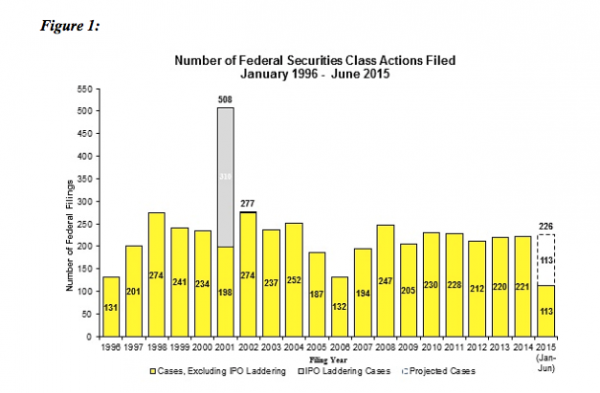 Is Securities Litigation’s Future Secure? As the rate of securities suits filed increases, prospects for securities litigation associates are expanding as well. Conversations we have had with partners on both sides of the aisle seem to confirm that business is booming, and there’s no sign of it letting up anytime soon. This should not come as too much of a shock. We predicted earlier this year that securities suits would rise and despite the disappearance of credit crisis class actions, they have. According to a recent study by NERA Economic Consulting (“NERA”), the rate of new class actions filed in the first half of 2015 annualizes at 226 cases, slightly higher than the five-year average of 222 cases and higher than the number of suits filed annually in the last three years. 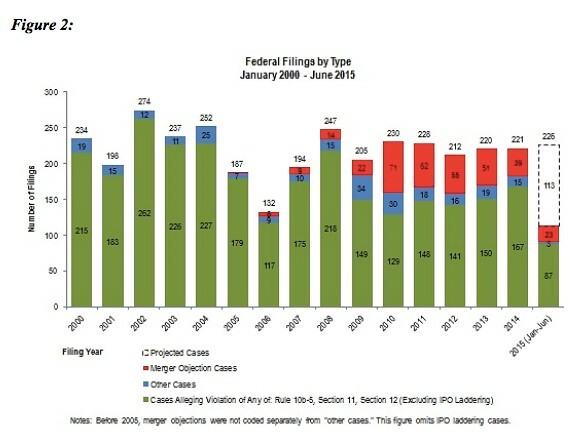 The number of “merger objection” cases filed so far this year also represents about 20% of total cases filed in the federal courts, on a pace to meet or exceed last year’s level. NERA reports that in 2014, there were 39 merger-related cases. Twenty-three merger objection cases were filed between January and June 2015, more than half of the 2014 total. Unsurprisingly, this uptick in securities litigation has coincided with a rise in lateral openings. Since January, 718 new associate positions have been opened for litigation associates nationwide. This annualizes to 1230 associate openings, a 14% increase over 2014’s total of 1071. Of those 718 associate openings, about 70 of them have been specialized securities litigation needs, with the largest concentration posted here on the West Coast. I recently spoke with several prominent defense partners at top firms, each of whom expressed confidence this trend would continue. Indeed, in the last quarter alone, we’ve already been approached with 23 new junior and mid-level securities litigation positions. The Bay Area has accounted for a significant amount of this growth, which is unsurprising given the parallel explosion of merger and IPO activity among tech companies in the Bay. Indigenous Valley firms appear to be leading the charge, thanks in large part to their stable of blue-chip clients in the tech sector, which by far represents the largest targeted sector of securities suits, comprising 25% of all new cases filed its January 1. In the past quarter, firms like Wilson Sonsini and Fenwick, which already have sizable and formidable securities groups, have been selectively exploring growing their associate ranks. Plaintiffs’ boutiques have also been in growth mode recently, including one of our most highly coveted clients in San Diego, with two current junior and mid-level openings. For junior candidates looking to earn a comparable defense-side salary but move beyond discovery tasks into tangible experience drafting briefs and making court appearances, opportunities like this one can be rare. Law students and junior litigation associates should consider securities litigation as a potential area of specialty. With strong growth prospects, high demand, and an omnipresence among both large and boutique firms alike, securities litigation remains a field of countless options. What's Behind The AmLaw 200 Numbers?